Les Vignes is a beautifully restored old Périgord style house made of natural stone. 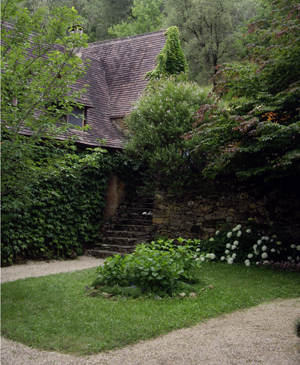 The house is the largest of all accommodations at Château de Roucaudou and can easily accommodate up to 6 people. The house is located behind the pigeonnier tower and has a flight of stone steps that lead to the main entrance. Les Vignes has a big living room, 2 sofas (one is a convertible sofa-bed), 3 arm chairs, 2 tables, a dining room with table with seating for 6 people, and a well equipped kitchen. The first bedroom has a large double bed (180 cm) and the second bedroom has a French double bed (140 cm) and a single bed (90cm), 1 armchair, and big wardrobe closet. There are two bathrooms with a bathtub, wash basin, and a toilet. In the front of the house there is a very nice terrace, with elegant wrought-iron garden furniture, and a small grassy garden area cuts into the hillside bordered by grape vines. Kitchen: Well equipped, 4-burner stove, oven, fridge, small freezer, microwave, toaster, coffee-maker, and dining table with seating for 6 persons. Living Room: 2 sofas (one with a convertible sofa-bed), 3 arm chairs, 2 tables, cupboard, and Satellite TV. Outside: Garden, terrace, barbecue, big round table with 6 wrought-iron chairs, and parking. Availability: Click Here to check Les Vignes room availability.